At Bruce Nurseries, we are here to help. No matter if you are purchasing plants, in need of some advice, or just trying to learn a little more about gardening and landscaping, we want to point you in the right direction. We created this learn more page to help clear up any questions you may have, and offer some helpful tips to those in need. Explore our resources below, don’t hesitate to reach out and contact us if there is something you’re curious about that hasn’t been covered! It is getting near the end of the season, so what’s growing now? We created a revised list of what we have available at the nursery. Each month Boone, our faithful farm dog, will choose one of his favorite plants from our nursery to feature. The plant feature articles include tips for planting, growing, and continual care. Gardening can be overwhelming for beginners and the sheer undertaking can deter people from even giving it a try. Follow these tips and get your garden started today. It is the most exciting time of the year, SPRING! Don’t be intimidated by all of the prep work, your dream garden will come to fruition before summer – with a little elbow grease. If you are not sure where to get started on your spring gardening, or you’re just looking for some tips, review our spring gardening checklist to help you get growing! Have you heard the term native plant being thrown around, and you’re not entirely sure what it means? Here is an in-depth description of what it means for a plant to be native. If you are looking to purchase native plants, review the inventory of native plants! 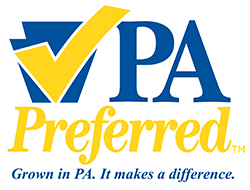 You may have seen the logo on our website, in our catalog, but what does it mean to be PA Preferred? We broke down the requirements of what it takes to be a PA Preferred business, and why it is best to shop from PA Preferred companies.